Thanks for the video! I design and sell QSL cards and still love to get them in the mail. KI7PMQ and KF4ZKU like this. Great video on QSL Cards. 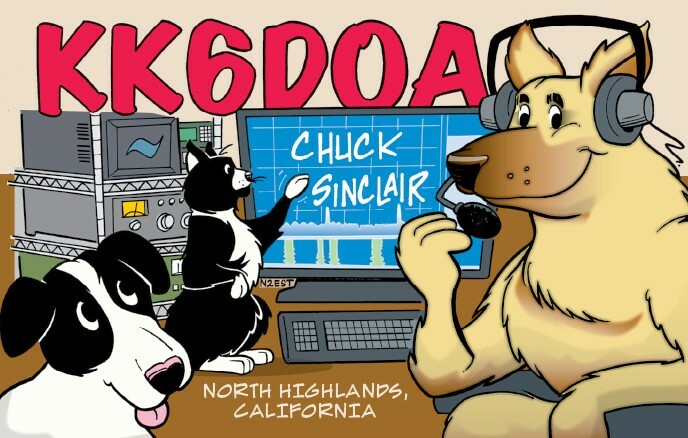 Check out my QSL on QRZ.com. Also, be sure to see my article in CQ November Issue about QSL Cards. If you want a copy of the article, email me at QRZ email address. Great explanation. I send artsy fartsy qsl cards most of the time. When sending to a DXpedition qsl manager, just a plain white simple card with all the data on one side to make the qsl manager's job easier. When processing thousands of cards, it takes less time for a basic simple card. Yes I have a QSL card. It is set up to print from my printer on QSL blank stock. Design in upper right corner on my QRZ page. Inspiration from photo while a very young ham seen further down the page. VIDEO WITH OUR CLUB MEMBERS. HERE IS THE THUMBS UP YOU REQUESTED. Christine Blasey Ford wants her glasses back. Just had this drawn for me, this would be my fur kids. KI7PMQ, KF4ZKU and (deleted member) like this.